If you love feasting your eyes on nature, spring is probably your favorite season. Between wildflowers, baby animals and babbling brooks, there’s nothing better than retreating somewhere beautiful for a day. Virginia is so idyllic that it can be hard to impress Virginians with natural beauty. We’ve discovered some Virginia sightseeing destinations that you’ll love anyways. With a name like that, how scenic can this destination be? The Great Dismal Swamp is, believe it or not, absolutely beautiful. With an area that encompasses Lake Drummond and miles upon miles of bucolic trails, there’s no better place in Virginia for a complete retreat. You can enjoy the wildlife- and bird-watching, sprawl out beneath the beautiful canopy, or just breathe in that fresh swamp air. Sometimes the urge to sightsee does not come with the inclination to exercise. Instead of firing up an episode of Planet Earth, hop inside your trusty vehicle and head to the mountains—the Shenandoah National Park and Skyline Drive, to be exact. Skyline Drive is a road that runs along the spine of the Blue Ridge Mountains, boasting astounding views all the way. And if the urge to hike does overtake you, there are plenty of opportunities to pull off the road and explore. Okay, so this isn’t exactly Yellowstone Park. As far as ocean views and people-watching go, though, there’s no better destination in Virginia. The Virginia beachfront/boardwalk proffers some unorthodox thrills as well, such as street performers, kite festivals, and car shows. So bide your time until the heat-wave that’s bound to hit, and then pack your bags for the beach! While it’s probably true that only nature can create the most pristine getaways, people can be pretty good at it, too. The manicured hedges, Japanese garden, and petting zoo at Maymont make it a marvel. This man-made park will be one of the most beautiful places you visit this spring. The 34 miles that make up the Virginia Creeper Trail in Abingdon are some of the most pristine Virginia has to offer. You can see streams, waterfalls, and arboreal wonders in concentrations not found anywhere else in the state. This is a premier cycling trail in Virginia, so grab a bike and set your eyes to feasting. With 200,000 acres of open land and 500 miles of trails contained within, the Mt. 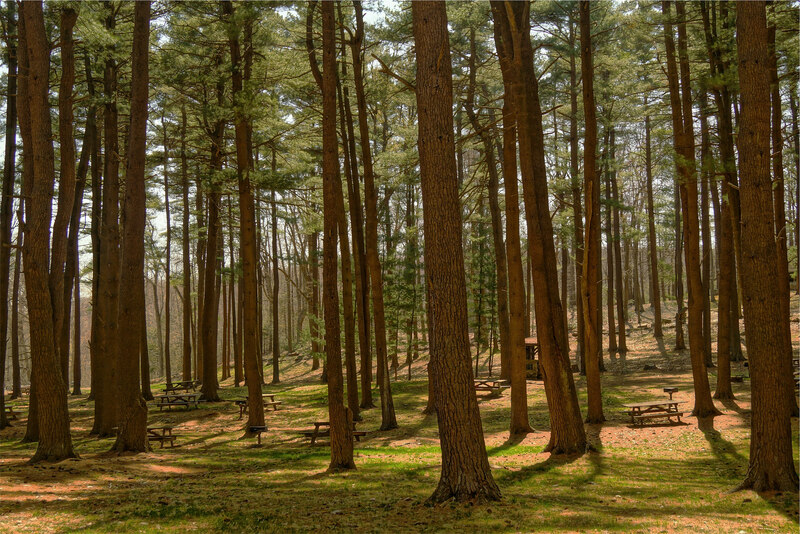 Rogers National Recreation Area is the epitome of an open-air escape. You can visit Virginia’s highest peak, scale convoluted rock formations, go swimming, or watch packs of wild ponies prance across the plains in this incredible park. And those activities are only the tip of the iceberg. This wildlife refuge on the Potomac River was created specifically for the preservation of bald eagles. It’s located ~18 miles outside of D.C., and we all know how much people love D.C. bald eagles. While you’re not guaranteed to catch a glimpse of the iconic fowl, the herons, deer and other wildlife are sure to please- especially in such idyllic settings as Virginia marshes, forests, and and the banks of the Potomac. Who ever said the sights had to be on Earth? The sky’s diamond network of stars and interstellar objects is as stunning as any national park. Better yet, the first and third Friday of each month mark a night of free observation and education at the McCormick Observatory. Next time nighttime sightseeing is calling your name, make your way to Charlottesville. Virginians live in the midst of grandeur. If you’re looking for a grand place to stay in this picturesque state, look no further than West Broad Apartments. Our features, amenities, and location are all top-notch. Contact us today to learn more!